Soh Daiko members are in the midst of one of their favorite times of year: Obon! After a wonderful weekend with Nen Daiko down in Fairfax Station, VA for the Obon festival at Ekoji Buddhist Temple, we’re gearing up for two more Bon Odori events right here in our local area, hosted by the Seabrook Buddhist Temple and the New York Buddhist Church. On Saturday, July 15th, Seabrook Buddhist Temple will host their 72nd annual Obon Festival in Bridgeton, NJ. From 4:00pm – 9:00pm, you’ll be able to enjoy dancing, traditional Japanese food, and soh much taiko, as all three of our sister groups come together for one celebratory performance. Admission and parking are free for all attendees. In addition to the general festivities, the temple is offering luminaries for purchase in the meditation garden, as well as intro to Buddhism talks in the hondo; a rare cultural experience for all who are interested! Bring a lawn chair or a blanket, relax on the lawn, and enjoy this beautiful evening. 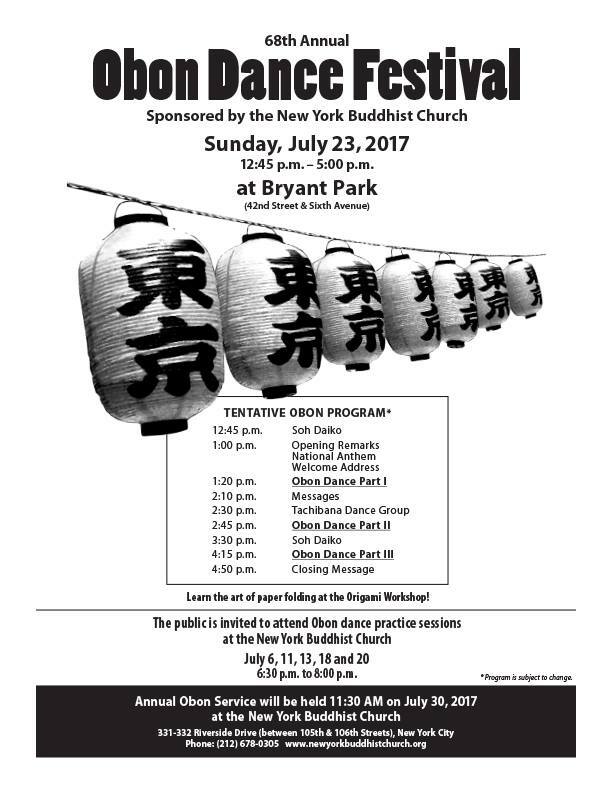 Finally, on Sunday, July 23rd, the NYBC will host NYC’s 68th Annual Obon Dance Festival in Bryant Park (42nd St. & 6th Ave.). Among the dancing and festivities, Soh Daiko will be performing two short sets, first at 12:45pm, and then at 3:30pm. Please take a look at the flier below for a full-day schedule of events, which will also include performances by our own Tachibana Dance group. We’re looking forward to a beautiful day in the heart of Manhattan. See you all on the dance floor!